The camera never lies, which is just as well because in the Audi e-tron Launch Edition two high definition cameras replace the door mirrors, bringing advantages in all-weather visibility, safety and aerodynamics. The ‘virtual door mirrors’ are among the most prominent indicators of the technological ingenuity behind every facet of the first ever fully electric Audi model, which is set to become available in the UK in early 2019 with OTR prices starting from £71,490. Taking the already comprehensively equipped lead-in e-tron model as its basis, the Launch Edition slots in above it at £82,240 OTR. It offers an exceptional specification that not only raises the profile of the five-seat SUV technologically but also visually. Platinum-look 21-inch Audi Sport alloy wheels provide even more impact than the already striking 20-inch examples fitted to the e-tron, the headlamp units take a step up from LED to even more intelligent Matrix LED technology enabling diversion of the light beam around surrounding traffic, and the conventional door mirrors make way for distinctive camera-based units transmitting images of the e-tron’s surroundings to two OLED interior displays. Also available for the standard e-tron, the foldable units reduce the width of the five-seat SUV by 15 centimetres. Their cameras have a resolution of 1,280 x 1,080 pixels, and offer good all-weather visibility thanks to a heating function which prevents the units from misting over or freezing, and also activates when the camera sensors detect dirt. can also be adjusted via the relevant display. Other visual hallmarks of the e-tron Launch Edition include a black styling pack taking in the Singleframe grille surround and window cappings and privacy glass extending from the B-pillar rearwards. Inside, additions such as a panoramic glass sunroof, illuminated door sill trims, matt brushed aluminium inlays and an upholstery upgrade from Twin Leather to Valcona Leather make the cabin an even more exceptional setting from which to enjoy the near-silent progress the e-tron’s two powerful electric motors permit. Phonebox wireless charging, MMI navigation plus and internet-based Audi connect infotainment services are of course included as standard as should be expected in the brand’s technological spearhead for the EV era. The list of convenience features also expands in the Launch Edition to include electric steering wheel adjustment, adaptive cruise assist, camera-based traffic sign recognition and a 360-degree camera offering panoramic views of the exterior of the car, plus a bird’s eye view, to help with parking manoeuvres. A 95kWh, 36-cell battery mounted beneath the passenger compartment is the lifeblood of the new e-tron. It feeds an electric motor positioned on each axle and is chargeable at fast charging stations with direct current (DC) at up to 150 kW – a first for a series-production car - meaning that it can be replenished to 80% of capacity in as little as 30 minutes. Recharging at home with alternating current (AC) is of course also possible, and is particularly efficient when a home wall box is installed. The two powerful, zero emission electric motors conspire to deliver an output of up to 300kW, facilitating 5.7-second 0-62mph acceleration, a top speed of 124mph and a driving range of at least 248 miles*. 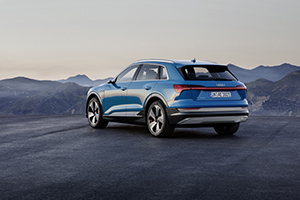 When operating in unison, they act as a sophisticated all-wheel-drive system, judiciously managing the distribution of the 664Nm of torque between the two axles to preserve the sense of calm and refinement that makes travel in the e-tron such a special experience. At launch, prospective e-tron owners who have taken advantage of the Audi UK deposit scheme granting priority ordering access ahead of the official 2019 on-sale date will also be given first refusal on a limited edition model – the e-tron Edition 1 – of which only 30 examples will be available in the UK. The Edition 1 will feature an even more exceptional specification that includes a panoramic glass sunroof, four-zone electronic climate control, a Bang & Olufsen Premium Sound System and acoustic glazing. Exclusive visual styling highlights that are exclusive to this specification range from the Antigua blue metallic paint, orange brake calipers and 21-inch turbine design alloy wheels to Audi beam incorporating an Edition 1 logo and aluminium exterior elements. More Audi e-trons emerge – The Audi e-tron – the brand’s first ever fully electric series production model – is set to arrive in the UK in early 2019 in ‘standard’, Launch Edition and Edition 1 forms, the latter initially reserved for depositors.